Even though it has been years, I’d like to think I’ll always be young at heart :P And nothing is fueling my inner little “princess” more than a delicious Unboxing Tea Party by The Butterfly Project with Bag of Love and Delectable Treats! I think I still secretly love tea parties, (ok, not exactly secretly!) that would be one of the reasons for my fondness towards The Mad Hatter. I can feel my excitement wanting to burst open like the surprises waiting to be unravel in April’s Bag of Love, plus the sweet tasty treats that’s screaming to be devour by Delectable Treats xD It’s like having a Birthday Party of your dreams! Surrounded by sugary treats and presents to open! To pass through the rabbit hole, one must prove one’s worth by illuminating the intentions of one’s desire to pass. 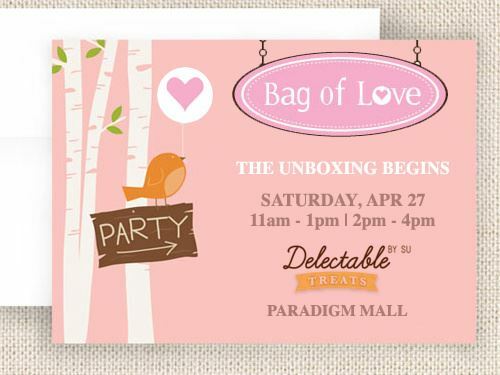 In other words, the requirement to stand a chance to be invited to this amazing tea party is to give your reasons why you would like to review the Bag of Love April Edition and attend the Unboxing Tea Party at Delectable by Su. Why I would like to review the Bag of Love April Edition? Bag of Love April Edition theme is Green! It doesn’t really matter what month’s edition, I am readily happy to review the Bag of Love. After reviewing their Debut Bag, there’s no stopping me from reviewing the others to come! They are the new Beauty Box and the only Beauty Bag in town. Mi Mi did an amazing job with the first bag. Something as unique and as special as this deserves an honest review and shout out! I wish to tell the world to hop in the Bag of Love wagon :) Plus, after my shocking experience unboxing the first box due to the courier service (wishing it would not happen again! 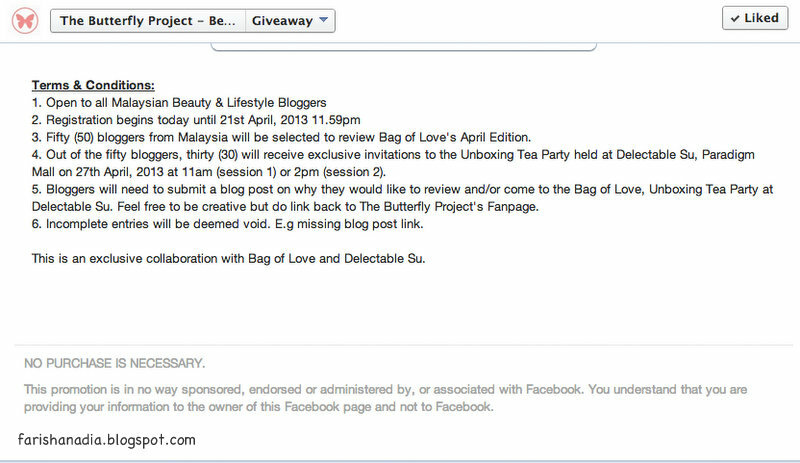 ), having the privilege to first open April’s Bag of Love at a tea party would be an amazing flip. Why I would like to attend the Unboxing Tea Party at Delectable by Su? If the reasons in the introduction are not enough, here’s some more! Another reason would be to record the Tea Party itself! This event would be the perfect opportunity to slip in another love of mine, video making ;) I can already imagine the deliciously colorful deserts and decoration for the occasion. I think it would be a waste not to capture the beautiful event in video. If you’re wondering why photographs are not enough? I’m not saying it’s not enough, but I want something more. You know the saying, “a picture is worth a thousand words”? Well, a video is able to record an average of 25 frames per second. That’s 25,000 words per second. Imagine if it’s a 5-minute video! You can write a novel LOL. All technicalities aside, it’s actually something I would personally love to do at an event like this. I even took the liberty to make a “trailer” to show what I have in mind to create! I filmed this at Delectable Treats, Pavilion (since it is the closest outlet to where I live). Of course I asked permission first ;) Su was kind enough to give me the green light to shoot there! Thank you Su! And the sales assistant there, Natasha, was also very friendly! I could see your passion towards blogging and how much you want to join our unboxing tea party project from what you have done. This is just too much... too much.. you've almost made me cry that this could exist, this.. passion. Thank you for inspiring me back Farisha Nadia. Old or new, inspirations never cease to chance upon us, in the most unexpected ways possible. Oh.. and congratulations, you're invited to the tea party this coming Saturday! was it 11am or 2pm that you could make it? And thank you so much for the invitation! :D Yeay! I can't wait >.< I'm able to make it at 2pm. Thanks again Tammy! Farisha! I just discovered you from the Butterfly Project. I can't believe you went through such lengths, I loved that you made such a cute video. Such dedication. Lol, I just wanted to do something different you know ;) It was a nice experience too! Well. Imagination IS better than knowledge anyhow so it trumps objective facts kan. LOL. Btw, I'll be going to the same session as you so I guess I'll meet you!